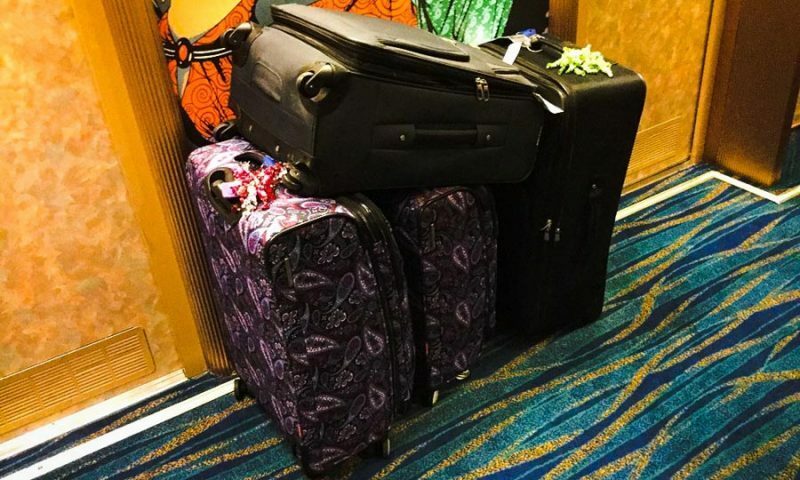 After putting in all that effort on packing for your cruise vacation it's important to make sure you also protect your cruise ship luggage. Follow these 6 ways to keep everything protected. You pack carefully for your cruise, choosing just the right attire and accessories for elegant formal nights, exploring ports of call, or just lounging by the pool. Furthermore, your luggage also contains other essentials such as medication, personal identification, travel documentation, electronics, and more. Disclaimer: Some of the links below may earn us a commission which in turn helps us provide you with better articles. 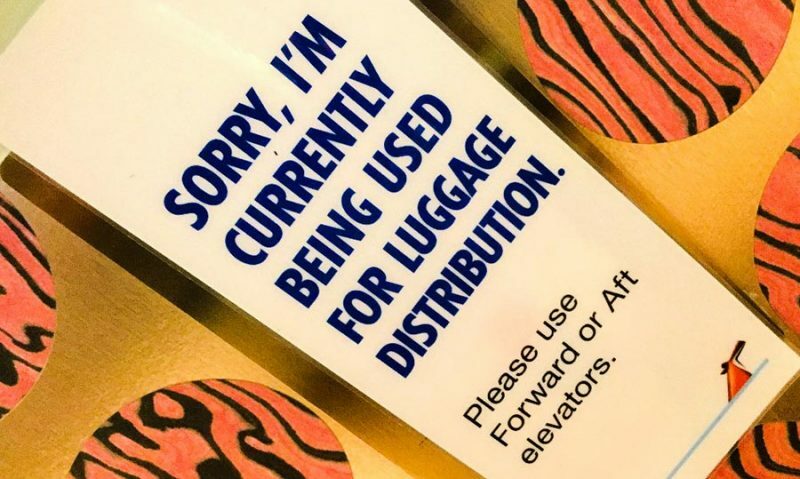 It can be disconcerting, then, to hand your bags over to a porter at a crowded drop off zone or check-in area long before you are on the ship, knowing that you may not see your luggage again for several hours and it could be changing hands several times. You may also be nervous that your bags could be sitting in a public hallway next to your stateroom door while you’re enjoying lunch or out exploring the ship. How can you protect your luggage and ensure your valuables are always safe? The easiest way to protect your luggage from loss or theft on a cruise is to be sure it stays with you until you can safely lock it in your cabin. Most cruise lines allow passengers to carry their own bags onto the ship. There will be no porters to assist with manhandling bags up and down narrow hallways and multiple stairways, however, and elevators may not be available as the crew completes embarkation day tasks. Take a look at all the luggage on Amazon which is perfect for your cruise. Furthermore, bags must fit through the port’s security screening equipment. The scanners are similar to those at airports so most bags will have no difficulty, but very oversized or awkward bags may not be able to be carried onto the ship. Once onboard, passengers may not have access to their cabins immediately and must be prepared to keep their bags with them until they can get into their staterooms. Passengers with suites or other priority reservations may be able to get to their cabins right away, such as with Carnival’s Faster to the Fun program, but passengers without those privileges must tote their bags along to the lunch buffet or find a convenient waiting spot until they can enter their cabin. Most cabins will be open to guests no later than 1:30 or 2 p.m. on embarkation day, so passengers arriving later in the day can go to their cabins with their bags right away. It is essential to pack light to protect your luggage. Not only will this make it easier if you are carrying your bags with you, but minimizing valuables in your bag will ensure there is less to worry about if you do turn your luggage over to someone else. Cruise ship staterooms, while efficiently laid out, are often short on storage space, and fewer bags will be easier to tuck into narrow closets or under beds to keep them out of the way during your cruise. Carefully consider everything you pack. Instead of your most expensive jewelry, for example, consider choosing costume pieces that will still look fabulous in your formal portraits. Trim down the electronics you bring as well – you might use your phone, tablet, and laptop frequently at home, but will you really use them during the cruise, when the itinerary is filled with exciting ports of call and fun activities? If you pack fewer valuables, you won’t worry as much if your bags are out of your control at any time. When you do need to pack valuables in your luggage, pack them so they will still be protected. First and foremost, put as many valuables as possible in a smaller bag that you can carry on to the ship yourself, even if you will turn larger bags over to porters. Expensive jewelry, travel documentation, medication, and other irreplaceable items should always be in your carry-on bags. Check all of these carry-on bags from Amazon. If larger valuables need to be in bags you may turn over to others, tuck those items deep into the bag and never put them in exterior pockets that can be quickly ransacked. Fold clothes around the items to cushion and conceal them, and take note of what valuables may have been packed in which bags just in case something is disturbed. Simple locks can help keep your luggage safe, especially if you turn bags over to porters as you board the ship. Opt for TSA-approved locks that will be suitable for airline use as well, and you can be confident your bags are safe for all your travel plans. Take a look at TSA-Approved locks for Cruise Ship Luggage on Amazon. If you prefer not to lock your bags, however, or if locks are cut off for security screening, you can still secure zippers using a twist-tie or a bit of string to knot around the zipper pulls and keep them closed. Anyone seeking to invade luggage will be looking for fast, easy access, and even a simple, low-tech solution like a piece of string can help discourage snooping and theft. There are some cheap luggage straps to check here. Many times luggage that has been tampered with or gone missing is not, in fact, theft or any malicious act, but simply mistaken identity. There are hundreds, even thousands, of pieces of luggage loaded onto every cruise ship, and a great many of them are black, navy blue, or other popular colors with very similar sizes and shapes. By making your bag distinctive, it’s less likely to be mistaken for another passenger’s luggage and accidentally be opened or shuffled through. Use colorful wraps around the handles or body of the bag, tabs on the zipper pulls, bold luggage tags, or even patches or stickers on the sides of the luggage to help it stand out so there are no errors. These bursts of distinctive color can also help you describe your bag to ship’s security if it is missing. All accessories to keep your luggage secure can be found here. If you do hand your luggage over to porters to have it delivered to your stateroom, it is possible that the bag may accidentally end up in the wrong location. Use the cruise ship’s luggage tags and place them firmly around handles for easy identification. Use bold permanent markers to write your name and cabin number on the luggage tags in clear, block printing so there is no mistaking the designated deck or cabin number. You can also get good Luggage Tags from Amazon right here. It is possible that the tags may loosen or be lost, however, so place a spare tag inside the bag in case it is misdirected. During the evening of embarkation day, if all your bags have not been delivered, notify the guest services desk with a description of your bag so it can be located and returned quickly. It can be worrisome to turn your luggage over for hours just as you leave on your cruise vacation. 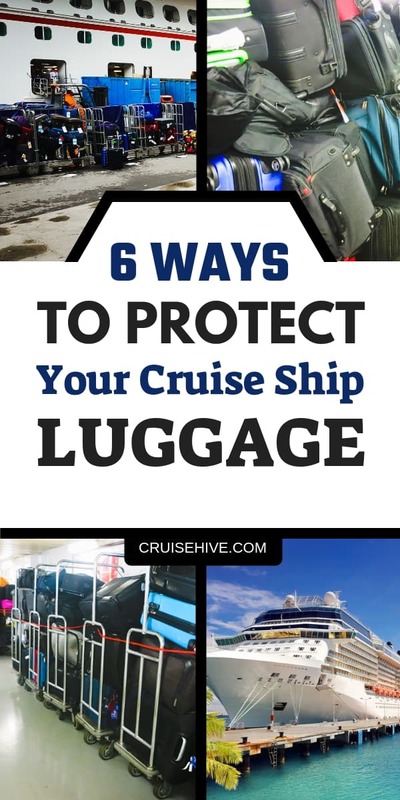 By taking simple steps to protect your bags, however, you don’t have to worry about your valuables and you’ll be ready to enjoy every minute of your cruise with all your luggage intact.